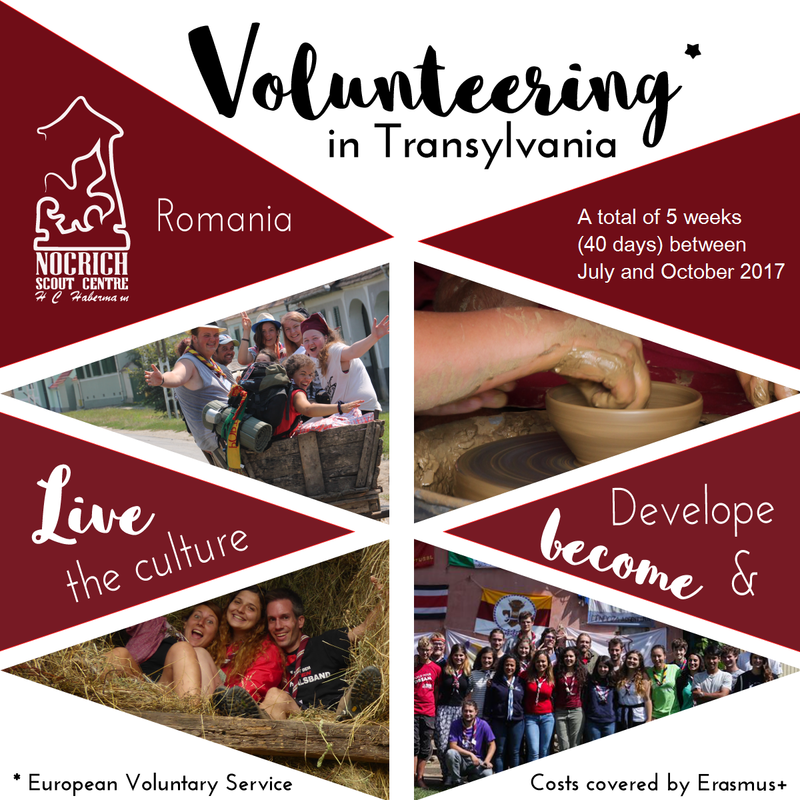 Nocrich Scout Centre in Romania will run a short term European Voluntary Service project on a flexible period of 40 days between the 20th of July to the 31st of October 2017. Now is your time to be an international volunteer in our scout centre! We are looking for ten volunteers aged between 18 – 30 from France to live this adventure with us. This EVS project is an opportunity of personal development for young people where they can experience volunteering, international scouting, living in a new country and multiculturality. You will get to live in the Transylvanian village of Nocrich, located 30 km away from Sibiu where you can discover the life at the countryside, nature and enjoy a lively atmosphere together with other scouts by making your contribution to the local community, learning about ceramics and pottery and also having fun while discovering Romania and its culture. If volunteering, scouting, learning or travelling are things you want to check on your bucket list this year, this is the right moment for you! Come and discover scouting in Romania, meet us and live 6 brilliant weeks at Nocrich Scout Center, in the heart of Transylvania. Accommodation and food are covered by the project, you will also get some pocket money, private health insurance and a refund for your international transportation up to 275 euro so all you have to contribute with is initiative, energy and being prepared to live 5 weeks in Romania. Are you prepared? Or maybe you know someone who is? The deadline for applying for this experience is “as soon as possible”. We are waiting for your CV and letter of motivation at nocrich@scout.ro. *The project “Volunteering for the community of Nocrich” is developed under the programme “Erasmus+ France, Youth and Sport” by the Association Tambour Battant, in partnership with the Nocrich Scout Center – H. C. Habermann.